Donald Davidson (1917-2003) was one of the most important philosophers of the late twentieth century. His work on language and the theory of meaning has been particularly influential.Two of the world's leading authorities on Davidson's philosophy, Ernest Lepore and Kirk Ludwig, provide a systematic exposition of his work in this field and of his contributions to philosophy of mind, metaphysics, and epistemology which spring from it. Their second aim is to assessDavidson's program critically, to mark its successes, but also to identify where its ccomplishments fall short of its ambitions, and, since it is an on-going research program, to assess its prospects for the future, and to contribute to the expansion of that program. Criticizing and extending Davidson's thought, as well as providing an introduction to it, Lepore and Ludwig address a broad academic audience. Their work will be of fundamental importance for those who are coming to Davidson's work for the first time; while some philosophical sophistication and training is presupposed, it is accessible both to advanced undergraduates and to graduate students. 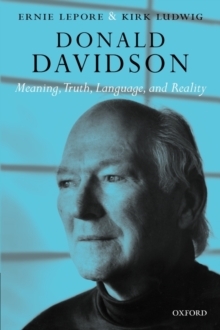 It will also be welcomed by professional philosophers, linguists, and anyone wishing to assess andunderstand Davidson's remarkable intellectual legacy.